Let me introduce to you ROCKTOPIA – the safe and exciting way to Rock Climb. 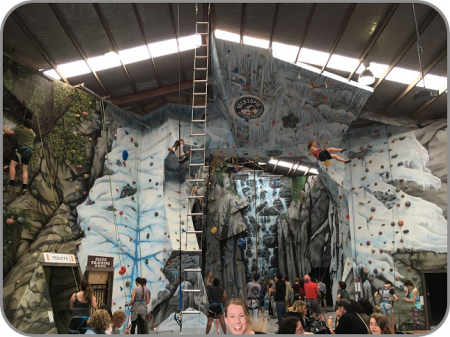 ROCKTOPIA’S mission is to inspire, motivate and challenge people to give Rock Climbing a go in a fun, supportive and stimulating environment. At ROCKTOPIA We have 19 climbing walls, built by climbers for climbers. These walls were built 22 years ago and have produced some of the best Rock Climbers in the country today. The fun doesn't stop there as we also have 2 boulder caves for those climbers serious about the sport and who want to push their limits and train for the big comps. Our smaller cave is 2.5 metres and has over 1500 holds. Our Elite Training room which is a 4 metre high boulder cave is set up with different challenges to suit most skill levels. We have the moon board in our Training room and you can download the app to use this along with kettle bells, trx systems, campus rungs and hang boards. If you are looking for a challenging work out then this training room has everything you need.